The debate is now on for a New Political Status among political parties in the Basque Parliament with a seat in Vitoria-Gasteiz. It should update and upgrade the Gernika Statute launched 40 years ago, still due to be fully enforced. Concerning the territoriality of the three Basque districts in the Basque Autonomous Community (BAC), our understanding is Araba (Álava) should comprise the enclave of Trebiñu (Treviño), with Biscay including the enclave of Turtzioz (Trucíos), something we consider as a key goal in the New Political Status. If the itinerary unravels as expected, by the end of term (2020), the Parliament should pass a new political design, due for approval in a referendum voted by the citizens. Then, it would be submitted to Madrid in order for a final deliberation. However, Madrid, i.e. the Congress and Senate of Spain, would still enjoy a right to veto, one they used against the Catalan Statute in 2006 and will foreseeably do so once again when they see fit. As Basque nationalists, since that is NAZIOGINTZA’s focus, we think that in attention to our Nation status, the New Status should include some fundamental premises establishing the avenues to undertake nation building and state building. We are willing to give up maximum demands for the sake of pragmatism, still making it clear that we do not aspire to achieve a partial self-government of the Basque Autonomous Community (BAC), but the independence of the whole Basque Country. By contrast, the proposals cited here are only minimal considerations to lay out the foundations for the construction of the state our Nation is entitled. They should, at any rate, stand for the minimal conditions necessary for a temporary political framework on the way to achieve the Basque Republic. 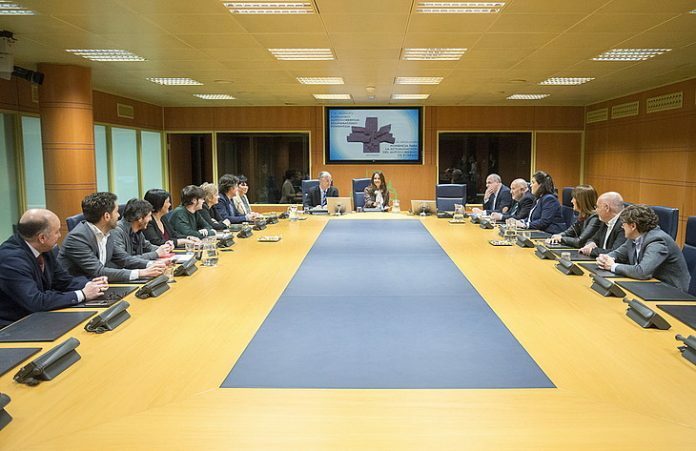 Note: With a view to thinking of the New Status put up by the Basque Government in Basque terms, its wording, names and concepts need to be conveyed in Basque language. 1.-) NATIONHOOD: The text needs to establish that the Basque Country is a European Nation nowadays divided into 5 distinct administrative realities and two states. They amount to five administrative units, since we include the enclaves of Trebiñu and Turtzioz, which native citizens and other people regard as part of the Basque Autonomous Community, despite its present-day status as components of Castille and Cantabria. We cite a European Nation inasmuch as our People meets all the requirements to be a Nation, either objective, like language, culture, history, or subjective, i.e. the collective resolve of its inhabitants. Beyond the Basque Autonomous Community (BAC), the Basque nation is made up of seven historic territories for which the New Status needs to account. The new text should therefore establish the integration of Trebiñu and Turtzioz into the Basque Autonomous Community, also providing the institutions necessary to manage the communal programs shared with, Lapurdi, Lower Navarre, High Navarre and Zuberoa, as well as short-run goals. 2.-) RIGHT OF SELF DETERMINATION: As a Nation, Basque Country holds the right for self-determination every nation is entitled and the UN acknowledges, standing for a democratic mandate that intended to bring an end to the turmoil, suffering and subjugation brought about by colonialism. This right has been endorsed twice by the Parliament of the Basque Autonomous Community (BAC) in 1990 and 2014. Therefore, we are not willing to step back, and we think the New Status should include the right of self-determination and set out the provisions necessary to implement that right. a) On completion of compulsory education, all pupils should have passed a C1 level. b) The public Basque language TV channel ETB1 needs to qualify as the main TV outlet of the BAC and as a referential broadcaster for the whole Basque Country, not ancillary to Spanish language ETB2, but inversely. It should include publicity encouraging Basque speakers to acquire literacy. c) ETB2 should become a TV channel where the Basque Country is a pivotal reference, with increased Basque language content and broadcasting publicity aimed at the encouragement of Basque learning for Spanish speakers. d) The work environment needs to make Basque its operative language, establishing the provisions, decrees and aids required for the purpose. On that note, all products in retail should show tags written in Basque as a default language, and distributors are likewise required to include Basque language on instruction labels. e) Leisure activities and sport need an increase in the use of Basque language. f) Universities are to be encouraged and equipped with the necessary provisions to have Basque as the preferential operative language, offering a Basque-only vocational training when it comes to services in direct contact with citizens, such as nursing, teaching, doctors. Universities cannot train professionals to work in an abstract world, but in the Basque Country. Planning is necessary to make Basque operative at different educative disciplines (manufacturing, economy, etc. ), especially in relation to labour market. 4.-) NEW BASQUE STATUS BODIES. The New Basque Status will rely on a few fundamental bodies, like the Judiciary and the autonomous police Ertzaintza, besides the Parliament liable for passing the laws. In the domain of Justice, with reference to the jurisdictional territory of the BAC, the main judicial organs and the High Court will be Basque institutions. All the divisions of the BAC’s law enforcement are to be assigned to the Ertzaintza, including international affairs and inter-police relations. The Spanish Civil Guard and the National Police are not liable to any attributions in this territory. On that note, a specific arrangement will stipulate the terms of their withdrawal. 5.-) IDENTITY: This domain needs to address three aspects. All citizens should own a National Identity Card per present-day international standards. All vehicles registered in the BAC area will carry a EUS identity tag. As for sports, the new political arrangement should include our right for Basque national teams. 6.-) EXCLUSIVE ATTRIBUTIONS: Besides those related to the social, political and economic domains, the government of the BAC should hold the following exclusive attributions: LANGUAGE, EDUCATION including university, and CULTURE at all levels. The Basque Government with a seat in Vitoria-Gasteiz should be fully sovereign in order to enforce the policies it sees necessary (curriculum, organization, etc.) without Spanish intervention. These attributions are irrevocable, as they are nowadays in Flanders, where the government of Belgium does not have a say in anything related to these topics. The text will also provide for a representative panel and proper procedures for participation of that Basque Government in the organs of the European Union and United Nations, so that it can defend its own interests. 7.-) UNILATERALITY. We are aware that the Spanish state will not easily come to terms with these minimal demands, since it does not believe in diversity. Should that scenario happen, the political actors of the BAC should trigger a unilateral road map, because Madrid’s right to veto would confine us to our customary subsidiary role. Therefore, let this be our last attempt to convene in a friendly way our national rights with Spain before setting out on a unilateral path. Finally, an important note. Should we reach a decent agreement and should we need to travel to Madrid, the Basque determination jurisdiction should prevail in the conformation of the New Status, which means that the new text will be subject to vote by the BAC citizens, and brought later over to the Spanish Congress for their consideration, and not inversely. That nuance conveys an important symbolic and political charge. The concept of self-determination was coined and accepted at the end of World War I as a way of taking resolutions in a peaceful manner and avoiding liberation wars. The right of self-determination was approved as a way to counter the negative and perverse dynamics of national conquests, colonization and subjugation, offering a democratic solution based on humans rights.